1) Basic – using a mathematically proven formula indicating the best decision you can make in any situation like: hit, stand, double, split, or surrender. 2) Intermediate Strategy – learning how to wager in a way that could increase your winnings over the course of many hands. 3) Advanced Strategy – learning how to take advantage of profitable situations by placing large wagers on hands you are more likely to win. “Hit” on card values up to 9 and “stand” on card values of 17 or higher, if neither are an Ace. If card values are between 12-16. It’s time to check the dealer’s up-card, “Stand” if it is a 6 or lower value card and “hit” if it is 7 or higher. “Double down” if you have a 10 or 11 and it’s higher than the dealer’s card. “Split” it if you have pairs: 4, 5, 6, 7, or 8 and the dealer’s up-card is 6 or lower. “Split” it if you have pairs of 8 or 9 and dealer’s up-card is 9, but never “split” if the dealer’s up-cared is 10! 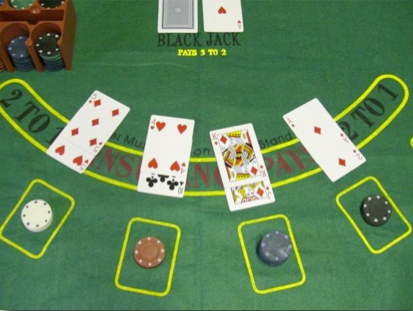 Interested in reading more about the table game BlackJack”? Download our FREE ebook: How to Play BlackJack 21 Winning Tips. Check out our FREE eBook library, and our selection of eBooks that cover other table games like Craps, 3-Card Poker and much more. Ready to try your new strategies for playing BlackJack? Come and join us at the tables on the Big “M” Casino! The Big “M” Casino offers great “Specials”, an “All You Can Eat Buffet”, and our FREE Cash Back Players Club Card. AM and PM cruises – check it out! Contact us online, make reservations online or call us at (239) 765-PLAY!